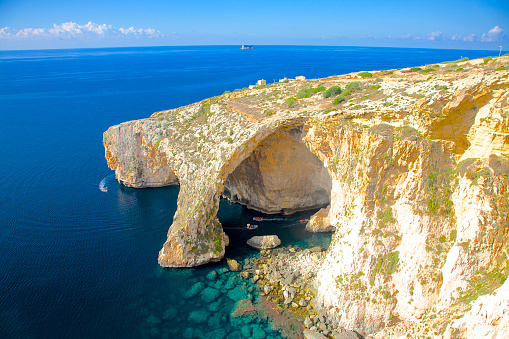 Our first stop includes a visit to Wied iz-Zurrieq (valley of Zurrieq) and a visit to the Blue Grotto. This picturesque grotto and its neighbouring system of sea caverns mirrors the brilliant phosphorescent colors of underwater flora. Boat trips to the caves which take around 25 minutes allow you to explore these grottoes and sea caverns along this stretch of coast. The cost of the boat trip is not included and operate subject to suitable weather conditions. We then continue to our next stop and an opportunity to experience a little local culture when we visit the pretty traditional fishing village of Marsaxlokk. Marsaxlokk, is a quaint fishing village and is characterized by low lying buildings and the colourful traditional fishing boats known as the 'luzzu'.Here you can also enjoy some free time at the local market which lines the full stretch of the seafront from one end to the other. After a visit to the market our tour comes to an end after our visit to Marsaxlokk and we make our way back. Even though it states very clearly on the website listing that it is not included? Had to really rush for the bus after the boat trip as we were the last boat from our group . Blue Grotto and the additional boat trip was fantastic!! This made the trip worth it!! Sadly our hotel pick up was nearly an hour late and the operator seemed to have many problems organizing the day however it was worth it! Marsaxlokk was a cute fishing village and we felt the time there needed to be either extended- so that you have time to browse the markets and have lunch OR shortened so that you could do one OR the other. We found we browsed the Sunday markets and then didn't have enough time to dine in a restaurant as they were so crowded and we only had 30mins spare. Not long enough to have a meal particularly when service is of such a slow standard in Malta. The Blue Grotto is definitely a must see!!! Ellen, this is a 4 hour half day tour. Please be realistic, there is only so much you can do and a lunch would take at least 1 hour - 1 hour 30 mins. Loved it, really nice tour guide and a beautiful morning. Blue Grotto was unreal and the boat trip was very special. Might be wise to call the tour operator the day before if you're staying in a less common hotel to make sure they know where to meet you.